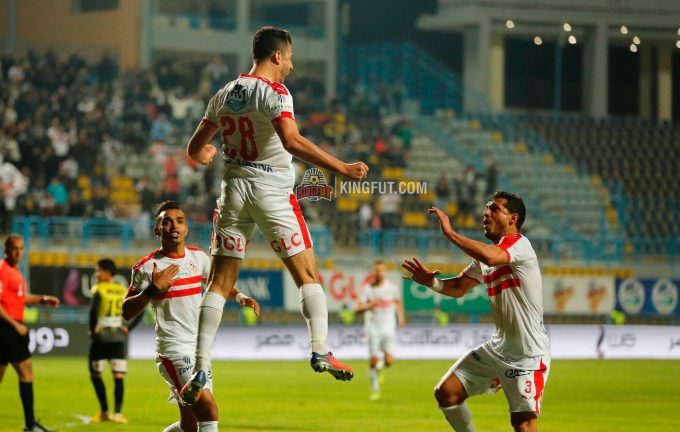 Egypt giants Zamalek have dropped two important points when they only settled for a 2-2 draw against Arab Contractors in a postponed encounter from the 25th round of the Egyptian Premier League. Despite the unfruitful stalemate, Zamalek maintained their position but couldn’t extend their lead on chasers Al Ahly ahead of the highly anticipated Cairo derby on the 30th of March. The Whites still sit on the top of the league table with 53 points, followed by Al Ahly with 51 points and Pyramids with 48 points. In the first 20 minutes Zamalek were obviously the team with the upper hand in the game and tried all methods leading to goal without success. In the 26th minute, Gross’ men earned a golden opportunity to take the lead when they won a free-kick close to the penalty box but their attempt wasn’t threatening enough to Contractor’s goal. Game resumed with the same high rhythm from Zamalek players until the goal arrived in the 45th minute through Mahmoud El-Wensh who cut on the near post to exploit a good cross from Kahraba on corner, just before the half-time whistle. The second half started with Gross subbing on Hazem Emam in Hamdy Nagguez’s place who had sustained an injury in the first half. Arab Contractors managed to come back in the game in the 52nd minute when Abdel-Wahab Ismail sent a low cross that infiltrated through multiple players and reached the back of the net. In the 60th minute, Zamalek succeeded in winning another penalty through Ahmed Sayed Zizo. The leaders’ Mahmoud Alaa stepped in to take the penalty as usual but his attempt was saved before Tarek Hamed scored on rebound to restore the lead. However, Emad El-Nahas did not surrender and pushed his team forward until they earned a penalty themselves in the 78th minute that was converted by top scorer Ahmed Ali.